Lying within the UK’s second most populous urban area, Manchester is one of the country’s most important cities. The Globalization and World Cities Research Network ranked it as a beta world city in 2014, making it the highest ranked British city other than London. Manchester is in the midst of a sharp expansion of its population. From mid-2013 to mid-2014 the Greater Manchester area added an average of nearly 50 people to its population every single day, according to government figures. The city’s population grew by 1.1%, compared to 0.8% across the UK. Over the coming decade, that growth is expected to speed up further, with analysts working for the city’s town hall forecasting a population increase of 20% by 2025. The reasons for Manchester’s rapid growth are varied. The city is at the heart of the UK government’s Northern Powerhouse policy, which seeks to redress the north/south divide and focus investment on the northern half of the country. Improved transport links and the diversion of money and power are intended to grow local cities, with Manchester pegged as the main beneficiary of the approach, having been handed a far-reaching package of powers by Chancellor George Osborne. An elected mayor, to be in place by 2017, will lead the city in its new flagship Northern Powerhouse status. In the longer term, Manchester is also set to benefit from the second phase of the UK’s new high-speed railway system, known as HS2, which will extend upwards from Birmingham and cut journey times from London to Manchester from 2:08 to 1:08. The system will also bring continental Europe within much easier reach for Manchester’s residents, with the current journey time from Manchester to Paris of 5:37 reduced to 3:38. The construction of the line should be complete by 2033. In the more immediate term, substantial regeneration work is continually improving Manchester’s city centre, transport network, cultural attractions and sporting offering. The forward-looking local government has focused on attracting foreign direct investment (FDI) and using it to the city’s advantage. So much so, in fact, that EY’s UK Attractiveness Survey figures released in 2015 rated Manchester as the UK’s third most successful city in terms of attracting FDI, up from fifth place the year before. The population growth experienced by Manchester has led to strong demand for new housing in hotspots across the city and the projected 20% increase in residents over the next decade has thrown into sharp relief the need for plentiful accommodation as demand spirals. Along with the rest of the UK, Manchester is experiencing a decline in owner-occupier levels within its property market. Nationwide, home ownership fell from 65% to 63% between the 2012/13 and 2013/14 English Housing Surveys, published by the Department for Communities and Local Government, to reach the lowest level for nearly 30 years. As home ownership levels have been falling, rental demand has been rising, creating an exciting environment for buy-to-let investors seeking to profit from property. 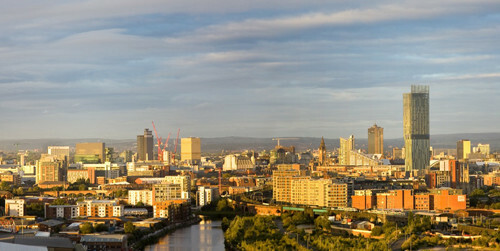 Manchester is one city to have benefitted from the growing trend. As those swelling the ranks of the city’s residents have placed pressure on the property market, investors have come to the rescue with a range of high quality buy-to-let offerings. But the sharp increase in population over the coming years will require a great deal more investment in new homes within Manchester, many of which will need to be rental properties in order to meet the heightened level of demand from tenants. The impact of this is already being felt, with Manchester listed as one of the UK’s top five areas for buy-to-let by yield in 2015, based on figures from LendInvest/Zoopla. Prices in the past year have risen correspondingly, up by 5.66% in the past 12 months and by 16.84% in the past five years, according to Zoopla’s data. Manchester’s unique situation has made it the ideal place for buy-to-let investors looking for a combination of capital growth, strong demand and competitive yields, not just in the short-term but, thanks to the vastly increasing population, for at least the next decade.